Starman: Back in 1961 he picked up an airbrush and started painting t-shirts inspired by Ed "Big Daddy" Roth, since then Star has airbrushed everything from clothing, walls, surfboards, cars, and tour shirts and personal stage clothing for Led Zeppelin, Paul and Linda McCartney, Donovan, George Harrison, Moody Blues, (the) Allman Brothers, Deep Purple and Bob Dylan to name a few. John Moseley: Primarily a plain oil painter by trade, John Moseley became acquainted with John Frazier through surf sessions at Swami's. Mr. Moseley has been a commercial artist since age 18. 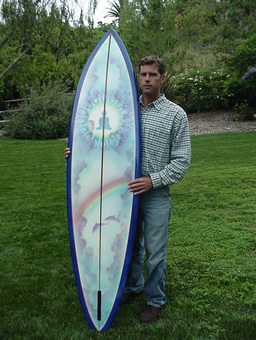 Bill Ogden: Bill Ogden is the artist responsible for the creation of the Rainbow Surfboard logo as seen on the home page. 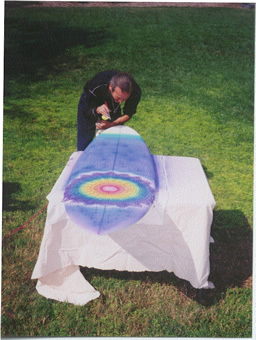 Bill Ogden has made an indelible impression on the surf art community. 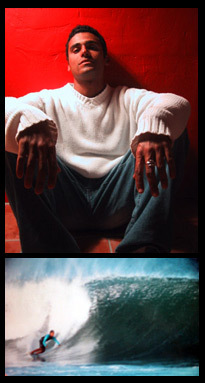 Ogden has been called one of the most influential and imitated surf artists of all time. Ogden’s work can be seen in magazines, rock posters and various other commercial art. It was during the 60's and mid 70's when Ogden became known for his original nouveau style of graphics, lettering, and figures; a style known as "the Southern California look". Cranebow: Crane has been airbrushing for over 25 years. 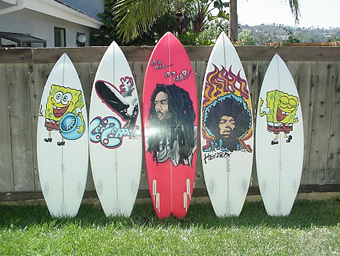 Rainbow Surfboards has inspired his airbrushing as well as friend Bill Ogden. He met Starman in the early 1970's. 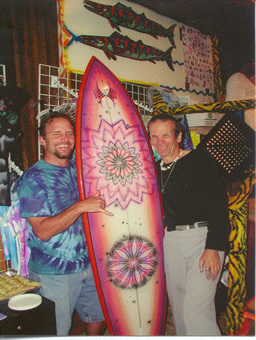 He has been working with Rainbow Surfboards ever since. Elizabeth Zaikowski: I was born in Berkeley, Ca and raised in Grand Junction, Co and currently reside in San Diego. My mother is an artist and my father an astrophysicist, with a very strong interest in art from childhood their influence shows in my work. I received my degree at San Diego State University in art. I have done many various forms of art, including illustration, ceramics, textiles, furniture, murals, sculpture, acrylic and oil painting. Andreas Grillet: Andreas Grillet is an expert acrylic painter.